Yesterday, I spoke with two of the NOAA Corps officers, Ensign Nikki Norton and Commander Brian Parker. Ensign Norton is in her first post as a NOAA Corps officer and Commander Parker has been in the Corps for 21 years. The NOAA Corps’ main responsibility is to oversee all operations of NOAA research vessels and aircraft. In addition to positioning the ship for deployment and hauling back of the various nets and instruments, they help chart the course to make sure that we visit all the transect stations. In fact, we missed an operation at one of the stations, so they are going to do a slight reroute so that we can make up for that lost data point! Ensign Nikki Norton wore many hats and had many responsibilities during our time at sea. Including serving as the OOD, Officer on Deck, essentially an extension of the CO while on watch in the bridge, she oversaw safety operations and was the medical officer. Interestingly, she holds a Bachelor’s in marine biology from Florida State University, which makes her well suited for overseeing the operations of a research vessel. You can listen to my conversation with Ensign Nikki Norton below. This morning, I visited the bridge and spoke with the Commanding Officer of the Shimada, Commander Brian Parker. Commander Parker has been a NOAA Corps officer for 21 years, working his way up from ensign to XO (Executive Officer) to CO. NOAA Corps officers work alternating sea and land posts for two-years at a time, and at the end of this year, Commander Parker’s sea post will end and his land post as Port Captain of the NOAA facility in Newport will begin. You can listen to my conversation with Commander Parker below. We arrived to our second to last transect, the Columbia River line, on Sunday. The Columbia River acts as an important source of food and habitat for certain marine species that the scientists on board the Shimada are studying and they anticipated interesting changes in the physical and biological data that they would collect at these stations. The long blue shelf-like line (labeled CR plume in top graph) shows decrease in salinity. As I’ve mentioned before, the CTD measures temperature, salinity and chlorophyll (a measure of how much plant material is in the water), which are collectively referred to as physical oceanographic data. 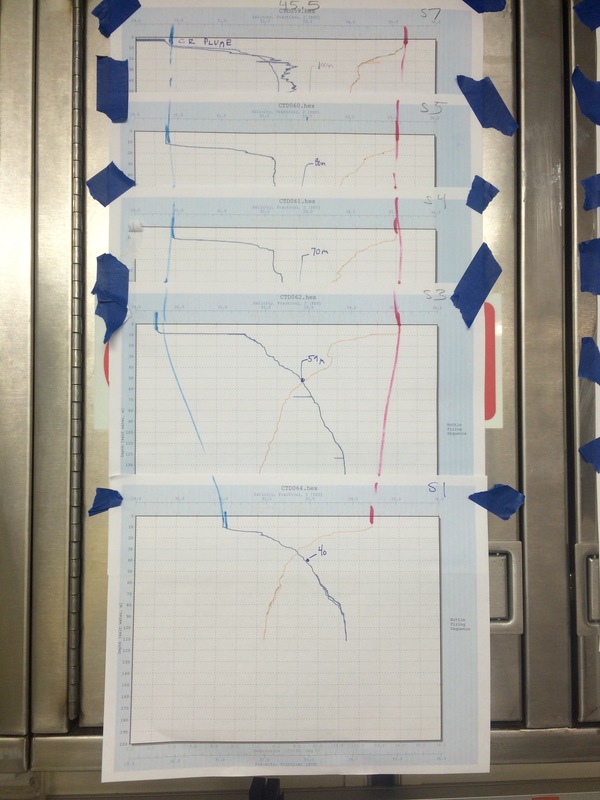 Dr. Curtis Roegner tracks the data acquired throughout the day at each station by printing the CTD graphs and taping them onto the cabinets of the Chem Lab, creating a visualization of the measurements. He looks for patterns in the data that may help him to better understand the samples acquired from neuston towing. In the graphs, you can see a dramatic change in salinity in the first 10 – 20 m as the ship passes through the fan of fresher water created by the emptying of the Columbia River into the Pacific Ocean. This area, called a plume, is the meeting of two bodies of water so different that you can see a front, a clear border between the salty water of the ocean and the fresh water of the river. The chem lab, wallpapered with CTD graphs. As a fisheries biologist, Curtis Roegner has several driving questions that guide the work he does on board the Shimada and back at the NOAA Center. Among the work he does, he aims to study how well certain projects in the Columbia River are working to restore salmon populations. Certain species rely on the wetlands of the river to spawn (produce young) and mature in and some of this habitat has been lost to the development of cattle grazing lands. Studying the impact of the Columbia River plume on the Oregon coast may help affect change in environmental policy and agricultural (farming) practices. I interviewed Curtis about his work and you can hear that talk below. Rougher weather kicked up a lot of swells, which the mighty Shimada crashed right through, sending spray all over the decks and outer stairways and producing just enough pitching and yawing to make a walk through a hallway interesting. The Shimada’s size helps keep the rocking and rolling to a relative minimum, but when at sea safety always remains a major concern. With that in mind, today I participated in an optional pyrotechnic training with some officers, crew and members of the science team. 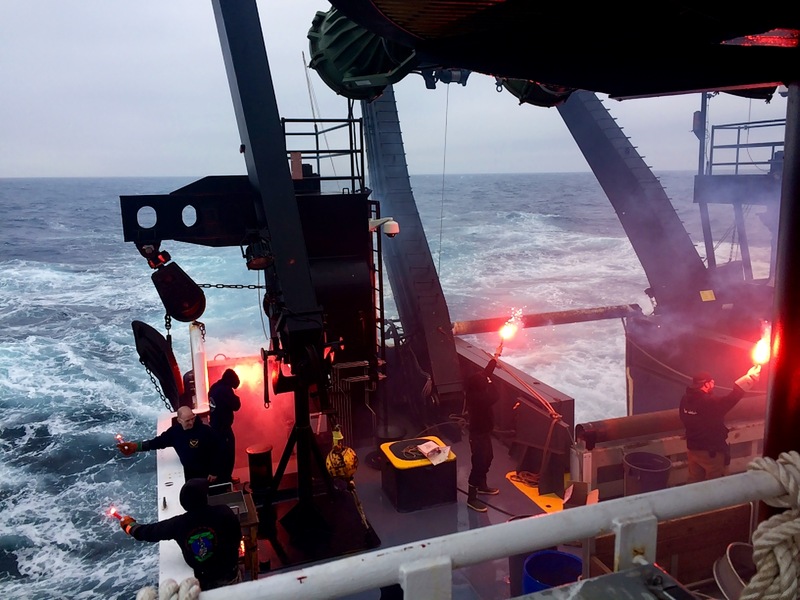 Several different types of flares and smoke bombs are used at sea to draw attention to a ship in need. Brittney holds a signal flare on deck while Will films from above. Toby does interpretive dance while holding a signal flare. In order to avoid a “crying-wolf” type of situation, we practiced this during the day and most likely radioed to all nearby vessels that we were in fact training and not in need of rescue. While I probably won’t be applying this skill in the near future, I decided I couldn’t miss an opportunity to try something new. Above you can see photos of different members of the crew and science team using these tools and below, you can see a video of me operating a flare gun. Lucky for me, we weren’t in an actual danger situation. At the end of the clip, I turn to NOAA Corps officer LT Tim Sinquefield for assistance. After some adjustment of the flare shell, you can see me successfully operating the flare gun below. To top off an even more unlikely morning, members of the night shift and I were watching the sun come up and helping Amanda with the bird and marine mammal observations when a pod of Pacific white-sided dolphins came to play off the bow of the ship. They stayed astern (toward the back of the ship) throughout the pyrothechnic training and at times, felt close enough to reach out and touch. 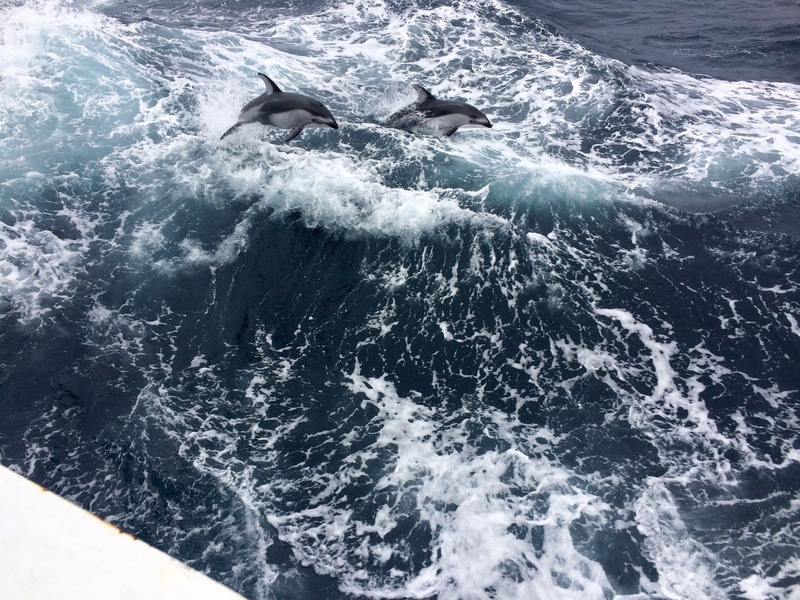 Pacific white-sided dolphins ride the waves near our port stern, seemingly for the sheer joy of it. As June 10 looms ever closer, I am frantically trying to take everything in. I’m basically operating under the mentality that I can sleep when I’m home. The more I try and experience, the less time I have to document what it is I’m learning on board the ship. But I set out to write eight posts about my time as a Teacher at Sea and I’m going to stay true to that commitment. Stay tuned for the final episode of my cruise aboard the Shimada, coming soon. This entry was posted in 2015, Alexandra Miller, NOAA, NOAA Fisheries Service, NOAA Teacher at Sea and tagged captain, Columbia River, Columbia River Plume, commander, CTD, juvenile rockfish, NOAA Corps, officers, OOD, rockfish assessment, XO. Bookmark the permalink.